We are not ones to blow our own trumpet (apart from that time we were in the Guardian, and, then we were all like, “hello, hello, you, yes we know you don’t know us but WE’RE IN THE GUARDIAN! What do mean you aren’t interested? It’s the Guardian, the GUARDIAN, we’re IN the GUARDIAN, hello!”). 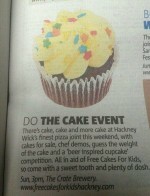 East London Lines wrote a lovely piece that really captured what we’re about and why we do what we do. 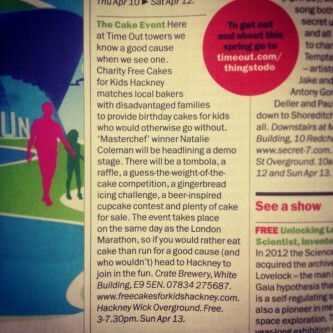 None other than Time Out, and then Metro, tipped our “CAKE EVENT” (a write up on which will follow soon, we promise!) as THE place to be in the whole of the Capital on that particular sunny Sunday in April. And as if that wasn’t all exciting enough, the Hackney Citizen wrote an awesome article about MasterChef 2013 winner Natalie Coleman becoming our patron (yes, we know, we’ve got some serious catching up to do on this here website!). Click the links; take a read; and see what you think.